Villa Maremma is for rent near Castiglione della Pescaia in Tuscany (Italy), only 5 km. from the beach. This stunning holiday villa lies on top of a hill near the historic Castellacio di Prile and commands panoramic views across the Tuscan countryside towards the sea. Villa Maremma comprises 7 bedrooms, 7 bathrooms, infinity pool, air conditioning and WiFi internet! Villa Maremma is only rented out per 2 weeks. Rentals can start on any day. 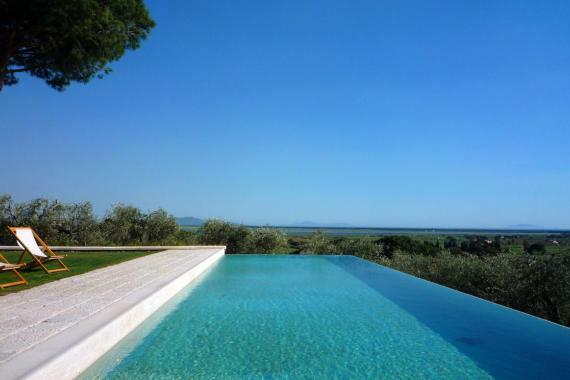 Holiday villa Maremma lies in the Tuscan hills near Castiglione della Pescaia on the Tuscan coast (5 km) with breathtaking views across the hills towards the sea. Castiglione della Pescaia is a bustling seaside resort with restaurants, bars and elegant shops. Villa Maremma was recently completely restored elegantly furnished. The villa is divided into 2 wings which can be easily connected by opening a door. On the ground floor there is a spacious living/dining area with fire place, a modern fully equipped kitchen and a guest toilet. The living area opens onto a large covered terrace with comfortable outdoor furniture. On the first floor there is a double bedroom with en suite bathroom and a private terrace. On the lower ground floor there is a double bedroom with en suite bathroom, a twin bedroom with en suite bathroom and a laundry room with washing machine. On the ground floor there is a spacious living/dining area with access to garden and a large terrace with outdoor dining furniture and a BBQ. There is a fully equipped modern kitchen, a double bedroom with en suite bathroom and a twin bedroom with its own bathroom shower). On the first floor there is a double bedroom with en suite bathroom (shower) and a private terrace with panoramic views. Further on this floor a twin bedroom with en suite bathroom. Villa Maremma sits in a delightful garden and a large vineyard. There is a lovely infinity pool (15 x 5) surrounded by a terrace with sun beds. Holiday villa Maremma is for rent near Castiglione della Pescaia on the uscan coast. Castiglione with restaurants, bars and shops: 5 km. beach: 5 km. Golf: 25 km. Grosseto: 25 min. drive. Piombino with ferry to Elba: 1 hr. Airport Pisa: 1 ½ hrs. Airport Rome: 2 hrs.